The HCG (Human Chorionic Gonadotropin) Diet may be the most popular diet you’ve never heard of. In fact, it’s been a proven weight loss option for over 60 years and receives over 10 million internet searches per month. It was first published in 1954 by Dr. A.T. W Simeons in his famous manuscript Pounds and Inches; A New Approach to Obesity. Women often lose between 20 and 30 pounds in just 30-40 days, while it’s not uncommon for men to lose 40 pounds or greater. But despite its proven track record and its widespread popularity on the web, it’s yet to go mainstream. In his new book, HCG 2.0 – Don't Starve, Eat Smart and Lose: A Modern Adaptation of the Traditional HCG Diet, author Dr. Zach LaBoube, founder of InsideOut Wellness and Weight Loss, critiques the traditional HCG diet using current research into low-carb ketosis dieting, the high-protein and high-fat diets of Inuit Cultures, and innovative new food statistics such as Estimated Glycemic Load, Fullness Factor and Caloric Ratios to offer a smarter alternative, explaining that a diet need not be the undertaking of a lifetime to yield life changing results. Both HCG 2.0 and the traditional HCG Diet combine a low-calorie diet protocol with the addition of the HCG supplement. The most common misunderstanding is that the HCG, in and of itself, produces weight loss, which is untrue. The weight loss is a result of a decrease in caloric intake, specifically in carbs. The role of the HCG is to target weight loss so that the dieter can maintain muscle mass while strictly losing unwanted fat. Additionally, HCG suppresses appetite by enhancing ketosis, which is a process that converts the body’s fat reserves into usable calories allowing us to sustain ourselves on our own stored fat. By summoning calories from stored fat, our body reacts as though it has just consumed a meal , thus producing a feeling of satiety and fullness. As Dr. Zach explains, "the more you help the HCG by limiting carbs, the more the HCG will help you." On a particular day, the traditional HCG diet could allow up to 80 grams of carbs in fruit, bread sticks and root vegetables. This is far too many to maintain an optimal level of ketosis, but what is more concerning to most medical professionals is the lack of protein in the traditional version, especially for men. "The idea of limiting protein while allowing up to 80 grams of carbs per day is contrary to everything we now know about the physiology of ketosis and low-carb living," says Dr. Zach. Not only does this slow weight loss, but it also makes the dieter hungrier as a result of not being supplied with these ketone calories from fat deposits. Perhaps the most significant variation between HCG 2.0 and the traditional HCG diet, and likely the reason HCG 2.0 has become the protocol of choice amongst HCG dieters is its use of a BMR (Basal Metabolic Rate) calculation to determine the amount of protein calories one is allowed to consume. This variation makes the diet more appealing than traditional diet that allows each dieter only 500 calories per day, whether male or female, big or small. And by incorporating basic food chemistry, that was primitive at best when the traditional diet was developed, it provides a wider variety of protein options and increases portion sizes of items higher in nutritional value, but void of empty calories that only contribute to weight gain. By adding smart calories, HCG 2.0 has revolutionized the traditional HCG diet making it a simple and sustainable weight loss option for the mainstream. And it’s done so without sacrificing the same rapid weight loss as the original. 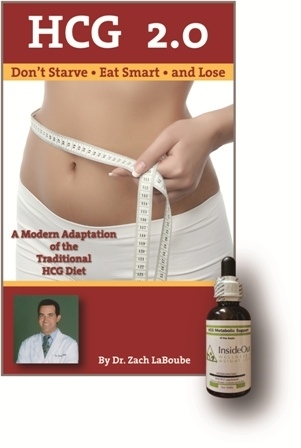 *HCG 2.0 was authored by Dr. Zach LaBoube, founder of InsideOut Wellness and Weight Loss.